Urban cyclists face the daily risk of 'doorings' when a driver leaves opens his car door as a cyclist passes by. This can be drastically reduced if drivers use the "Dutch Reach" to open their car doors. It means simply using one's right hand to open the door which forces the driver's body to turn and see oncoming cyclists. A British Columbia study indicates that doorings are the car-to-cyclist crash type causing the most injuries to cyclists. Seattle has told the E-bike companies that they will have to wait for permission to operate the E-bike trial projects are completed. Like most cities, the current infrastructure was not designed for alternative modes of transportation. "A little over a year ago, Seattle led the nation, becoming the first major city to open its streets to shareable bikes that didn’t need docking stations and could be left almost anywhere. A year later, Seattle has taken the opposite tack with a similar technology that’s proven more popular than the bikes." This data informs the transportation decision making at all levels. Volunteers are vital to the success of this project: about 400 people are needed for the count. For the 2017 count, volunteers tallied more than 63,500 people biking and walking in communities across Washington. In 2017, the number of people who walked, biked or used other active modes increased 4 percent over the 2016 count. 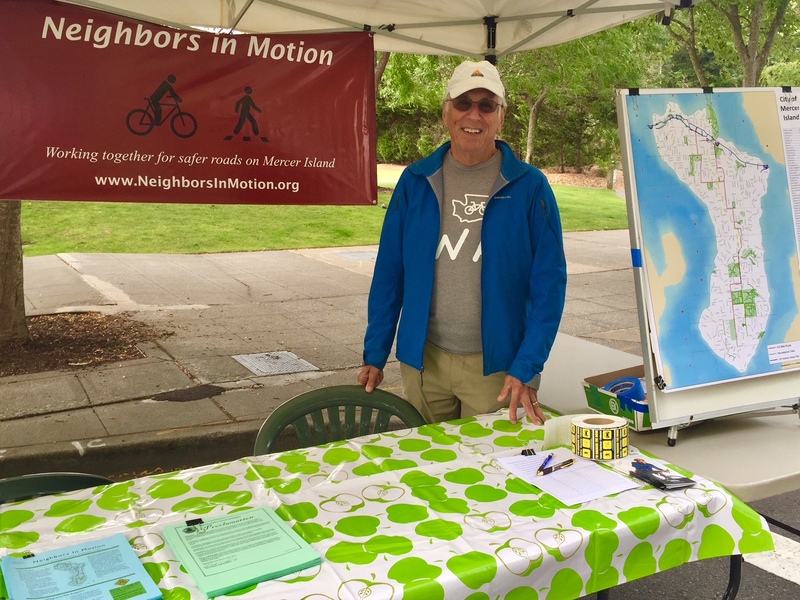 Neighbors in Motion held a information booth at last weeks Mercer Island Farmers' Market to advise residents about signage improvements in the city's North-South pedestrian/bicycle route. A final section of the route or "Missing Link" in front of Island Park School is scheduled for design via public process next year in the city's Transportation Improvement Plan. NIM will have another booth at the September 30 market. 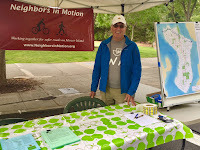 NIM is grateful for Mercer Island Community Fund's sponsoring this effort. Uber and Lyftare already in Seattle. But they might be arriving anew, this time with smallermotors and fewer wheels. The two ride-hailing giants are among three companies that each applied for a permit to operate dockless bike shares on Seattle’s streets — which is to say, free-standing bikes that riders can pick up with just a few taps on their phone screens. 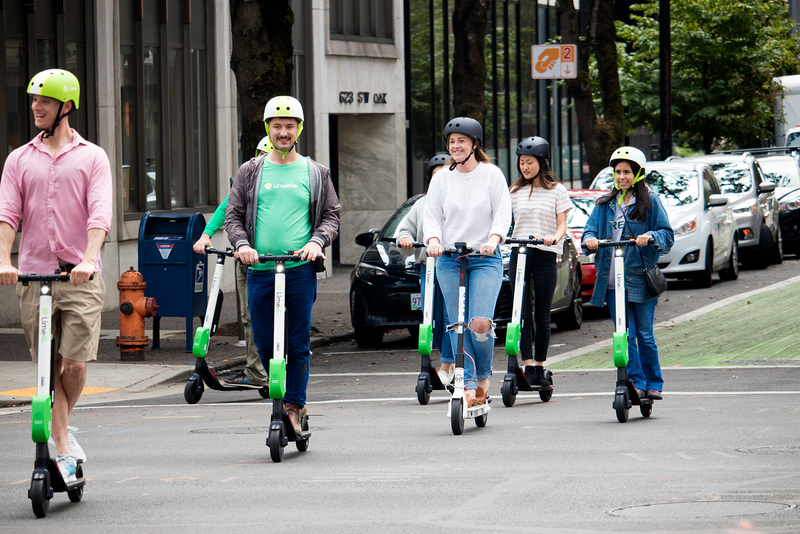 JUMP (owned by Uber), Lyft and LimeBike (who has been operating here for the last year) are all seeking to operate bike shares in the city over the next year, the Seattle Department of Transportation (SDOT) said Friday. Lime Bikes is currently running a pilot on Mercer Island. Using Bike Share? Check the brake cables before you ride. Video of a vandal cutting bike share brake cables in Sodo. Seattle police investigating. Have you always wanted to be a bikecommuter — but needed a little help when it comes to suiting up and facing Seattle traffic? Meet StarterKit from Seattle Times, a gear guide for the rest of us. Think of it as a kinder, gentler introduction to the bare essentials you’ll need to take on the Northwest’s most popular sporty hobbies.